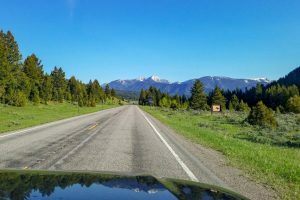 Getting to Montana is not difficult – but you need to determine where you’re headed. And where you’re headed, is dependent on where you’re staying. (More on that tomorrow). Charles and I decided that for this trip, we were going to stay in West Yellowstone. It’s close to the west gate to the park, and fairly central to get to everything you’d (well, we’d) like to see. We flew from Raleigh to Atlanta and then from Atlanta to Bozeman. The total flight time was about 6 hours, and there was a layover in Atlanta. It was a fairly easy flight and while we left RDU really early – we got to Bozeman early enough to get groceries and make the drive to West Yellowstone with enough light to enjoy the drive. There are Pros and Cons of every area and direction you arrive from – so while I can’t tell you that our way was ‘best’ it was pretty dang awesome, and I’m sure we’ll do it this way again! Next up – Where to stay! Previous PostPrevious 20 Minutes to. . . . . Buffalo?